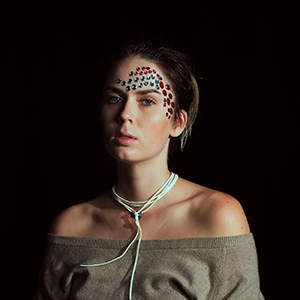 Alla Blehman is the producer, musician, singer and composer from Saint-Petersburg, studying music production and art of recording in Koninklijk Conservatory. She grew up with the most progressive, unique and bright oldschool jazz environment of the city. Playing alto / soprano saxophone and singing not only on the main jazz and pop venues of the country , but also in underground and original projects collaborating with the most broad and various musicians and genres from funk to contemporary as the leader and the band member as well. One day she left the city of the most intelligent hearts and upset creative minds and nostalgic fogs of the canals of Neva with the wild forests of Siberia, and came to Amsterdam as Peter the Great. But instead of learning how to make ships she learned a lot about music at Conservatory of Amsterdam, where she met Nina Virant. Apparently, Nina appeared to be very similar fruit and shared her story of leaving her mountain with fields around in the middle of Slovenia. She also brought her goat, which became the symbol of the further friendship of Alla and Nina, making them stay so far away from their motherlands and share their stories with people around.